It's the festive season and we will not apologize for the enormous quantity of mince pies we've already consumed. Nonetheless we've still found time to cover all the latest in the world of wearables. This week we put Apple's GymKit to the test, took the Levi's Google smart jacket for a ride, looked at how wearables are tackling mental health, and brought you our best advice for keeping the winter training going on the treadmill - and burning off those pies. Again, no apologies. One of the biggest stories this week came from Fitbit, which rolled out the app store for the Ionic smartwatch. We were disappointed this didn't make the launch, but it's here now and you can go download a handful of apps from third-party developers along with some made by Fitbit's new in-house content team, Fitbit Labs. So far there aren't a huge amount of apps to choose from, with many of the announced names gearing up to launch by the end of the year. But The New York Times, Philips Hue, Flipboard and Yelp all have apps ready to go, with more to come from Lyft, Nest, TripAdvisor and British Airways - check them out here. Thomas Sarlandie, Fitbit's director of software engineering, told us that a key learning from the Pebble transition was how much people like customizing and changing their watch faces, and so Fitbit has also made available over 100 faces to pick from with the new update. As much as the Ionic gets a lot right, we felt it was an incomplete device when we reviewed it. The App Gallery (as Fitbit calls it) slots in a big piece of the puzzle that was previously missing. Oh, and users outside the US will finally have access to a streaming service in 2018, as Deezer will be launching its app on the watch. Now we're just waiting on that audio coaching and sleep apnea detection. In other Fitbit news, it and Jawbone finally ended their long-running dispute concerning intellectual property that Jawbone accused Fitbit of taking. Do you like to live dangerously? Do you walk on the grass when clearly instructed otherwise? Do you, like me, sometimes remove the USB drive without hitting eject first? Is your life teetering on the precipice at all hours? Then perhaps the next time you need to send a friend some money, you'll ask Siri to do it for you. Because you now have that option: this week Apple Pay Cash was made available on the Apple Watch, meaning users can send up to $3,000 to another person from the smartwatch. You can do it by entering the amount with a few taps, or you can ask Siri - but be sure to enunciate your desired monetary amount very clearly. And while we're on this theme of breathing new life into existing wearables, we also had a try on Apple's GymKit this week, which makes the Apple Watch work with (supported) gym equipment, sharing information between the two. And last, but by no means least, the Oculus Rift also got a big update this week, though it's only available in beta for now. 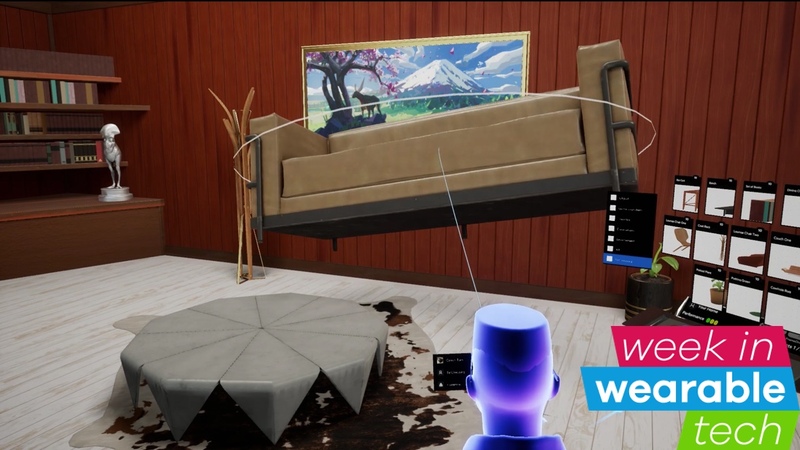 Rift Core 2.0 brings an entirely new, customizable Home area to the Rift interface, as well as a new feature called Oculus Dash that lets you interact with PC applications while in the Rift. It's similar to what Microsoft's Windows Mixed Reality platform does by letting you open desktop apps and stick them to walls, for those moments you feel like a bit of Excel spreadsheet action while playing Minecraft (again, you know who you are). It finishes off a big year for Oculus in which we've seen some truly excellent games and new features, along with a much lower price. We can't wait to start decorating our new virtual home with the update. There's a catalogue of furniture and interactive objects you'll be able to choose from, some of which will need to be unlocked by completing achievements. It's a lot like The Sims but, well, I guess now we are all Sims. Oh my... God.